Tuesday morning I read an article on the Milwaukee Brewers website talking about how Ryan Braun was enjoying a quiet offseason, unlike last season when he won his appeal on his 50-game suspension. Boy, was that short lived. "During the course of preparing for my successful appeal last year, my attorneys, who were previously familiar with Tony Bosch, used him as a consultant. More specifically, he answered questions about T/E ratio and possibilities of tampering with samples. There was a dispute over compensation for Bosch’s work, which is why my lawyer and I are listed under ‘moneys owed’ and not on any other list. I have nothing to hide and have never had any other relationship with Bosch. I will fully cooperate with any inquiry into this matter." Though I have never studied law in any level of education, I don't think it is too farfetched that Braun and party would speak with Bosch for his appeal. Sure, Braun needs to explain why his name is mixed in with those other names, but everything else about his statement seems cogitable. Tackling some of the critics questions here, let's look at the most brought up: Why would Braun and Co. consult with Anthony Bosch? Ryan Braun was going to be given a 50-game suspension before it was overturned by the successful appeal. Previously stated, Bosch was linked with Manny Ramirez at the time of Manny's 50-game suspension. If I wanted a proper defense, I would consult with someone who has experience with the situation I was in. Bosch wouldn't have been the only one Braun's people consulted for the entire appeal regarding the process of MLB's testing procedures. I'm sure there were many parties involved. But, I'm sure Bosch had some important information that helped Braun build his case. As far as Bosch being a creditable source, I'm sure that was brought up in full depth during Ryan Braun's appeal last winter. Braun addressing media after last year's successful appeal. Well, then: What does the 20K-30K dollar amounts have to do with Braun? That's pretty simple to explain. People don't talk for free. 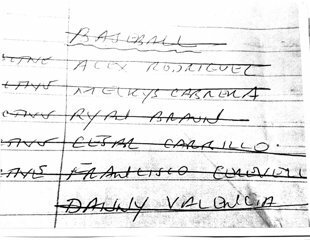 The sum of money listed next to Braun's name is likely the amount it costed Braun's people for talk to Bosch. Simple as that. There may have been a dispute in dollars, which may be the reason for the different dollar amounts. But, but: Why didn't Braun come out and talk last week when the original report was released? I had only one explanation for this, until I read Wendy Thurm's article on FanGraphs. My original thinking was, as simple as it may sound, that it never dawned upon Braun that his name would show up in Biogenesis documents. The original report never listed him, so why think otherwise? But Wendy brought up a great point as well. Had Bosch been a private consult, Braun could have breached the law of confidentiality with Bosch. That would have caused more issues than there already are with this situation. “I was not familiar with Tony Bosch prior to Ryan Braun’s case. In the 15 years that I have represented players facing discipline under the various professional sports leagues’ substance abuse and steroid programs, I have relied primarily, if not exclusively, on Dr. David L. Black and his team of scientists at Aegis Sciences Corporation in Nashville, TN as my experts with respect to scientific and other matters relevant to the testing of player specimens. Based on that logic, Braun's explanation seems credible. Now, let's get one thing clear. Braun's statement from yesterday does not make him exonerated. Also, Braun's statement raises a few questions that will likely have to answered when Major League Baseball investigates Braun. However, using some common sense and just knowing what occurred with Braun last year, it sure makes it seem Ryan will be cleared of this repeat accusation in as many offseason. "I see nothing that linked Braun to drugs from that clinic." >>Previously stated, Bosch was linked with Manny Ramirez at the time of Manny's 50-game suspension. If I wanted a proper defense, I would consult with someone who has experience with the situation I was in. So, if I'm looking to exonerate myself before an arbitration panel on suspicion of taking PEDs, I'm going to consult some guy who sold PED's to Manny Ramirez? How does that help? Why not consult with the doctors Ramirez would have consulted with? What specific information could Bosch possibly have given that would be helpful? The answer of course, is very little to none. Even Braun's own attorney admits that Bosch's contributions were "negligible". So why pay him $30K? Let's not pretend here that Bosch was Braun's only consultant he used for his appeal. Do you really think he would have won if he did? Bosch likely had critical information regarding the processing of the drug tests as well as other connections with the system. I'm sure Braun and his attorneys talked with many doctors as well. Unless you know Bosch personally, I'm not sure how serious I'll take your "little to none" part. Braun's attorney only sounds like a PR move to help protect Braun. I'm going to sit back and watch the investigation unfold just like how the appeal went last year. With Braun's statement, there are many questions that need to be answered. Had you read more in depth above, I don't think I would have had to repeat myself as much in this response.